Before “being a adult who writes Kim Kardashian fanfic” became my claim to fame, I was a person who made zines. I would dump out sewing kits full of content onto the internet and pick up the pieces I liked best to save in print. Books that I made by hand and sold online, writing little notes on the inside covers, addressing and stamping envelopes, wondering who are all these people buying my books. This was a big part of my life from 2001-2012? Weird that it was all so long ago. Everything went off the rails when I started writing novels. Anyways suddenly! recently! I had 2 new zine projects in the works and no idea how zines were made anymore. My first book, Twelve Times Lost, was extremely a scissors & tape & photocopy affair, but most of my other books were done in Microsoft Publisher. I think? This was all so long ago and I hate thinking about the past so grain of salt. But iirc I had gotten the program for free on some computer and used it for everything book related for years. It worked great, better than you’d expect, and I never had any complaints about it. But I don’t have it anymore and I guess it still exists, but not on my computer and not without a subscription. InDesign seems to be what many people use to lay books out these days but I do not have the money to access it nor inclination to learn a new program on a tight schedule. And anyways there’s so much new tech and tools these days, apps for everything, so I assumed I would find amazing resources for making zines online, probably using Google Docs or at least maybe Apple Pages? But tons and tons of searching produced zero results. This is still so bizarre to me. So finally I tweet my frustration and 30 seconds later mathowie has shown me this really killer template in Google Slides. It’s not full-featured or robust or overflowing with helpful text manipulations tools, but it removed the barrier for entry I faced and a few minutes later I’d reconfigured the template how I needed it and was putting together the book. I went to F*d*xK*nko’s to print out a copy and see what it looked like in my hands, then I rearranged a few slides and it was ready to go. Repurposing an online presentation software for print media felt like a solid, modern DIY medium between scissors and tape and an Adobe Creative Cloud Membership Plan. Anyways the two books. 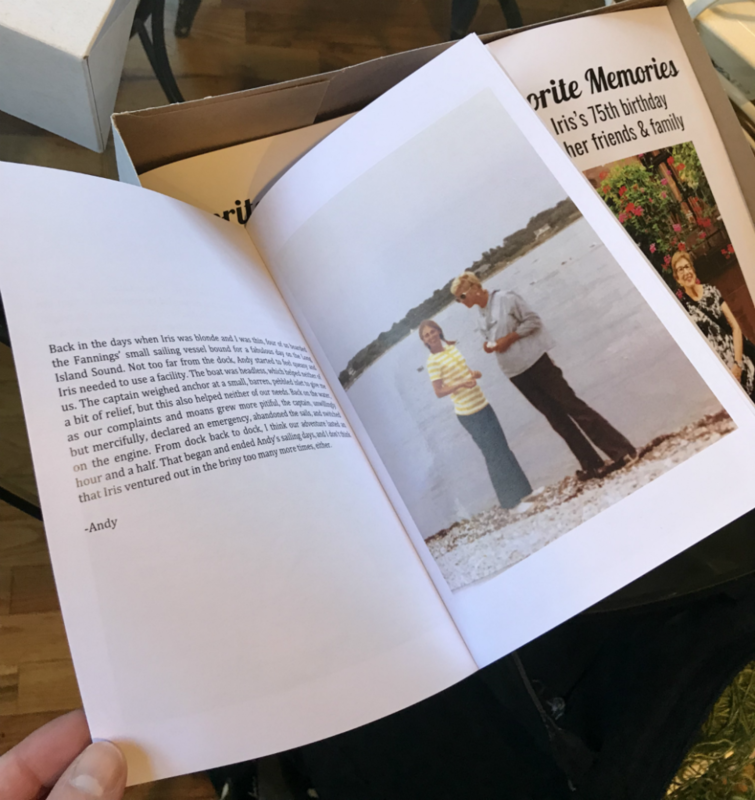 The first was this thing I put together for my mom’s 75th birthday, collecting people’s favorite memories of times with her. Big hit, you can imagine. The 2nd is a Trader Joe’s zine Sarah and I are working on and you’ll probably hear more about it soon. The end!